Two thumbs up for Louis! "Louis just finished installing a new toilet in my apartment. I wanted to be home for this one because of my pets. The need to make several trips in and out of the apartment always worries me that one will get out or something else equally as annoying/scary. Louis was super awesome about not only being very conscientious about closing the door in between trips of carrying my toilet in and out of the building, putting shoe covers on to save my carpet, containing the water that inevitably gets all over when a toilet gets taken out. He was very personable and friendly! This was the best experience I've had yet here! Thanks so much! Kudos to you Louis for being awesome at your job as well as being personable and understanding to my situation. I appreciate it very much!" "Shout out to Mark Anthony in maintenance! I lost my key from having a little too much fun and Saturday morning he was sweet enough to make me a new one very quickly ! Also he did some work on my apartment and was kind enough to call me and let me know what was going on! He is great, schooner cover is lucky to have him on there team! " "Mark Anthony is the best, and hes a great trainer!" Carpet Cleaners - Excellent Job!! "I just wanted you to know the company that cleaned my carpet did an excellent job. They were very professional and arrived within the allotted time frame. They even helped me move a couple of things around so they could do a more thorough cleaning. Kudos!!" "I wanted to say I had an awesome experience with a ton of work request that needed to be done and due to my schedule and having pets wasn't every able to schedule. Louis called, scheduled and came over right away. Managed all of the concerns with timeliness and efficiency... I have nothing but praise....Thank you Louis for all you do and did." "Maintenance is always great, they come and explain what they are doing and they get the job done in a reasonable amount of time. Thanks Maintenance guys. " 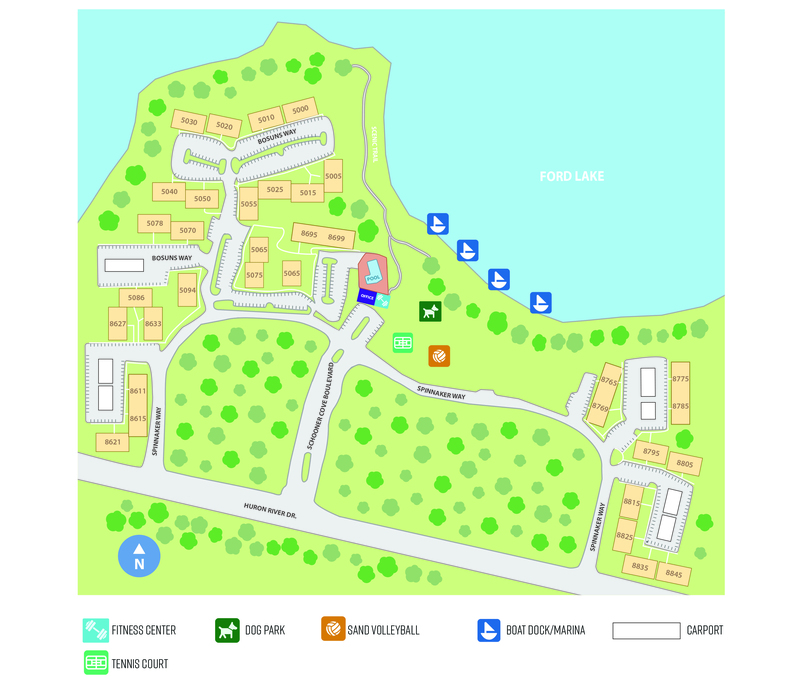 Schooner Cove Apartments located in Ypsilanti, Michigan are set right on the banks of beautiful Ford Lake. We offer spacious studio, one- and two-bedroom apartment homes. As a resident in our community you will enjoy scenic lake side living. Enjoy the view from our signature sunrooms, patios or balconies. Indulge in a lakeside BBQ picnic, relax by the pool, challenge friends to a tennis or volleyball match; all while still at home! We take pride in our community and want you to enjoy your home and community, we offer 24-hour emergency maintenance if ever you need. Schooner Cove is home to a vast blend of community features, designed for your convenience at affordable rates. All apartments are equipped with an intercom entry system, fully stocked kitchens, additional storage in your apartment, and tons of closet space with built in shelving. We offer built in bedroom vanities and walk in closets in select apartments.